With the Six of Swords, it’s smooth sailing from here on, at least for a while. Take a load off and let the universe do the driving. You’ve earned it. Turning his staff of power into an oar, Mercury plays the serenading gondolier as he takes you through the currents of Aquarius. As a special treat, Saturn, who rules this sign gives you a private tour. 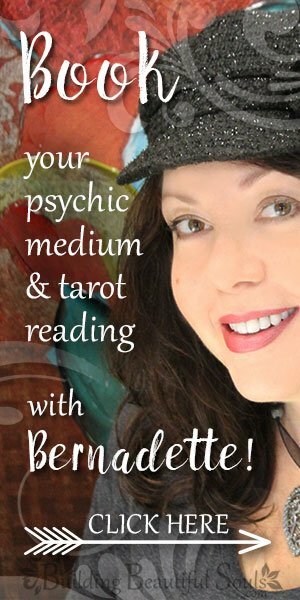 He’s a very knowledgeable guide in the Six of Swords tarot card, so pay close attention. By the way, the Six of Swords is known by Kabbalists as the Lord of Earned Success. Saturn is the “Great Initiator,” but his path to initiation is not always easy. It requires work, patience, and a willingness to accept your responsibilities in this life. But over time, it will lead you to true spirituality. Yes, it’s a lot of work, but with the right attitude, it’s not all that hard. Working his way across the waters at a slow, measured pace, the ferryman’s posture in the Six of Swords is actually quite relaxed. And while the destination is still far in the distance, things are already getting better. You’ll notice that the water at the bottom of the Six of Swords tarot card is turbulent, but calm on the other side of the boat. Just let the ferryman do his job. He’ll get you there safely, and you’ll arrive when the time is right. Those lands on the far shore of the Six of Swords are of the same blue and grey as that of the water and sky. These colors represent the activity of your subconscious mind and a higher, perhaps spiritual understanding. Emotions are healing. Ideas are beginning to form. Spiritual goals are now coming into view. The Six of Swords tarot card is that wonderful moment when you’ve stopped spinning your wheels. As you’re coasting, you notice a strange thing: The world keeps turning, anyway. But it’s not passing you by. In fact, you’re making more progress than you think, even though it feels like you aren’t doing anything, at all. That’s because you’ve already done the necessary work. Why else would you feel so tired? The Six of Swords’ underlying themes are journeying and healing. The healing shown here is emotional. A time of stress and tension is coming to an end. 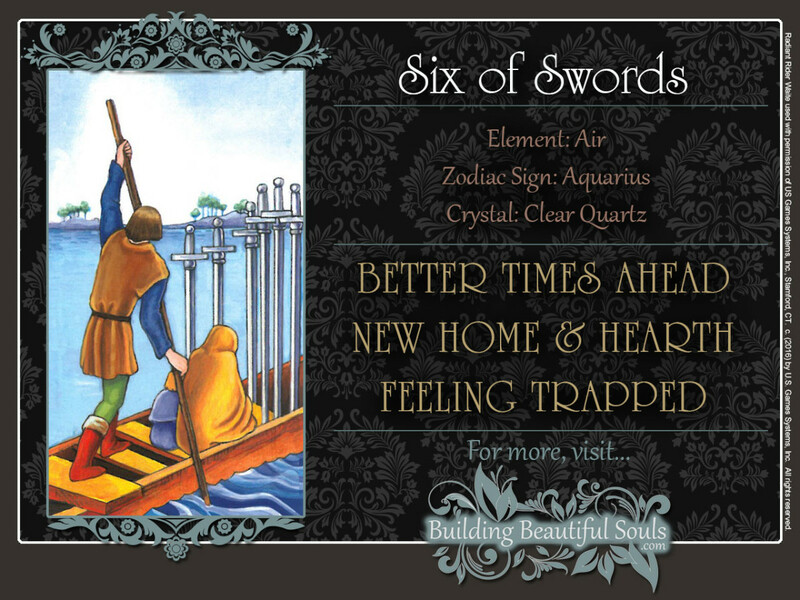 Headed for calmer waters, you can breathe easier with the Six of Swords. Use this time to decompress, but don’t start digging around in the past just yet. It’s still too soon to mull over old hurts or traumas. That could slow down your healing process. The swords are at rest. Their tips are buried in the bottom of the boat. Pulling them out to inspect them for rust damage could sink it. The time for that may come, but for now you need to be patient. Spiritually, you are moving toward a new level of understanding. This time of rest and quiet allows you to see the overall pattern in your past experiences and insights. In the Six of Swords, see how there are four swords on one side of the boat, and two on the other? In the Suit of Swords, the 2 and 4 are about balance and reflection. Achieving it was hard work at first, but it became easier with practice. Now, it requires hardly any effort. The Six of Swords also suggests intellectual growth. This is the process in which all the pieces fall into place. Trying to learn a new language, you may have bored yourself silly with those flash cards. But it’s paying off now. For example, traveling abroad, you may suddenly need to ask a stranger for the nearest restroom, and your question has left your mouth before your hand could reach for the phrase book in your pocket. By the way, this may actually point to travel in your future. The journey will be safe, so put all those travel horror stories on the news channel out of your mind. Bring your digital camera and invest in an extra memory card. When reversed, the Six of Swords tarot card points out that your emotional balance has been upset. Maybe you feel insecure about the direction your life is taking. Sometimes, this is the result of changes that occur naturally in your body. Teenagers, for example, often experience an existential crisis as they try to find their place in the world. With the proper guidance, this is a crisis they’ll weather just fine. Maybe your worries about the economy are leaving you with a feeling of powerlessness. Being aware of the gravity of your situation is healthy. But if you let your worries paralyze you, you will do more harm than good. As Thomas Payne put it, “These are the times that try men’s souls.” Of course, he meant women, too. As long as you’re alive, you have options. So use this crisis to show the world what you’re made of. Are you trying too hard to solve a long standing problem? The Six of Swords tarot card may warn you that it may be too soon to do the heavy lifting, if you’re recovering from a past trauma. Get your strength back before you open up old wounds. It may even be better to leave the past behind completely. Remember that the swords stuck in the bottom of your boat are also stopping its holes. Another interpretation suggests that a healing process is now beginning. It’s a bit like coming back from the dentist. The shot has just worn off, and your gums are beginning to feel pretty sore. Good news can also throw you off balance, for example when someone you’ve been attracted to suddenly confesses that he or she has a crush on you. Kabbalistically, sixes correspond to the sun and its promise of a higher, spiritual life. In traditional Numerology, 6 corresponds to the emotional currents of Venus. The number 6 also merges the above with the below. Here, the intuition is merged with the understanding of the spirit.